JPGDLL.DLL demo - 362 KB - New January 17, 2011. Demo of a free DLL that saves and loads JPG images. Based on a demo shared by Mike Bradbury (mike_ukmid). Text with Transparent Background - New July 24, 2010. GDI+ Image Loading - New May 14, 2010. Sprite Batch Masking - Update October 13, 2008. Slide Show - 15 KB - New October 18, 2007. Display pictures in a slideshow to a MIDI accompaniment. EZTwain Demo - 36 KB - New January 20, 2007. A demo of the free EZTwain DLL, based on code by David Drake. FlowChart To Go - New November 15, 2005. A flowCharting tool, released as open source. Icon Machine - Update March 4, 2005 for LB4.x. Extract icons from files, use bitmaps or create new icons in 16 colors. Save to LB4 runtime engine. Similar to icon editor in LB Workshop, but with fewer features. Screen Capture - New August 25, 2004. Capture screen image and save as bitmap. Stretch Graphics Demo - New August 13, 2003. Shows how to scale drawn graphics and loaded bitmaps to any size desired. 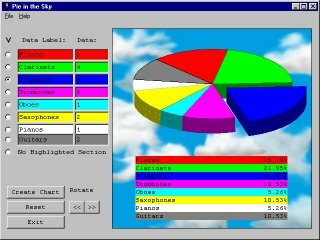 Pie in the Sky - Updated June 12, 2003. Pie Chart Creator submitted to Extreme Coding Challenge at the LB Forum. Now allows a piece of pie to be separated, and allows the entire pie chart to be rotated. This version deletes drawing segments to release memory and allows up to 8 pieces of data to be entered. Simulating a Mouse Event - New May 7, 2003. Use the API to simulate a mouse event. Bitmap Printing Demo - New October 29, 2002. Use MSPaint.exe to print a hard copy of a bitmap from a disk file. MSPaint does this invisibly, so the user never sees it. See also: the graphicbox printing demo listed below, which uses ShellExecuteA to print a bitmap. Nviewlib.dll Demo - 128KB Updated October 29, 2002. LB3 only - demo of freeware DLL that allows programs to load and display images in many formats, including JPG and GIF. Graphicbox with no borders! - September 9, 2002. Remove the borders from a graphicbox. Color-matched Bmpbuttons June 21, 2002. Match the background color of bmpbuttons to the user's system color. Pixel Play - 6KB May 12, 2002. Image pixel manipulations. Hide Bmp Files - May 12, 2002. Two methods to hide bitmap files from the user. Print hard copy of graphicbox 1KB April 11, 2002. LB3 only - LB hard-copy graphics printing results in a tiny printout. Use ShellExecuteA to run default bitmap application in the background to print graphics. Easy graphics arc 1KB April 11, 2002. LB3 only - Draw an arc easily with API calls. Demo of draw.dll 11KB April 10, 2002. LB3 only - Use freeware draw.dll. Snowy Night - 228KB December 14, 2001. Will work with LB2 and LB3. Graphic demo using sprites to simulate snow falling.